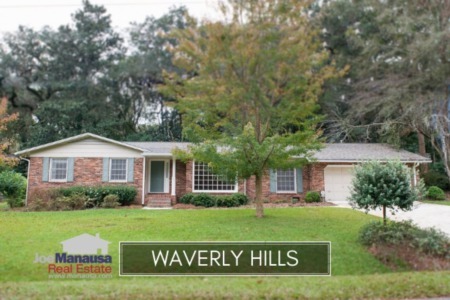 If you are looking to live "inside of I-10" in the Northeast section of the Tallahassee real estate market, consider Waverly Hills with spacious lots and homes built in the 1960s and 1970s. Situated on more than 400 wooded acres and centered on Waverly Pond, Waverly Hills has much of what Tallahassee's homebuyers are seeking today in midtown. In this report, we will look at prices, values, and sizes of homes in Waverly Hills, as well as show current listings in the Tallahassee MLS and all closed home sales going back to 2002. For the housing graphs found below, you will find the number of closed home sales for each year (blue columns, measured on the left vertical axis), and an important real estate statistic shown in red (measured on the right vertical axis. Home prices rose 1% in 2014, marking the third consecutive year of gains for Waverly Hills. The average recorded sales price last year was $261,000, meaning Waverly Hills continues to serve as an affordable mid-town location for buyers looking to spend $200,000 to $300,000. Home sales activity declined 22% in 2014, but I suspect this is due more to the strength of the prior two years than to any negative trend occurring in the neighborhood. Note that the number of homes sold during 2012 and 2013 were nearly identical to those recorded at the peak of the housing market. The fewer home sales in 2014 could simply be a case of fewer homeowners in Waverly Hills needed to move. In total, there were 14 homes sold there last year. Average home values in Waverly Hills declined by about 1/2% in 2014, but still remain 17% higher than the low of $91 per square foot established in 2011. In 2014, the average value of a home sold in Waverly Hills was $106 per square foot. (Buyers Note: This is a 22% better buy than the values recorded when the housing market topped out at $137 per square foot in 2006). 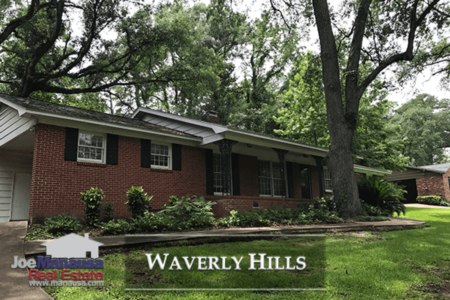 The average home size sold in Waverly Hills typically falls in a range of 2,300 to 2,700 square feet, and 2014 home sales were most active just below the middle of this range. The 14 home sales in 2014 averaged 2,451 square feet, which is just below the median home size in Waverly Hills. Understanding the kind of "deal" this is for buyers is simple. These 2,400 square foot + homes are selling for roughly $100,000 less than are similarly sized new homes, on home sites with mature landscaping, in a highly desirable location. For these reasons, Waverly Hills represents great value for homebuyers ready to make a move. The following list shows home sales going back to 2002 in Waverly Hills. I hope you enjoyed our February 2015 update on home sales in Waverly Hills, please feel free to drop me a note if you have questions not covered in this report.